With such observations on Armenian culture, California monologist Vahe Berberyan kept a sold-out crowd at the Yerevan Chamber Theater laughing for 90 minutes last Friday evening. "There is nobody like him in Armenia." 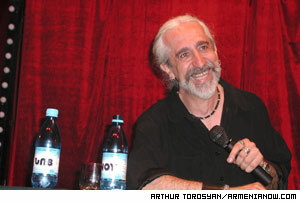 In a performance titled “So Far”, Berberyan brought standup comedy to Armenia where, previously, audiences were more accustomed to hearing a Russian humorist poke fun at Russians. This time, it was an Armenian, comparing his people with other nationalities. When Russian humorist Mikhail Zadornov compares Russians and Americans he says that Americans are surprised at Russians when they see that a man wearing a tie and coat enters stage, talks and people begin laughing. In Berberyan’s performance the Armenian audience got a chance to see an American-Armenian (from Lebanon) enter the stage and make people laugh. But in this case the actor has a far different appearance. Berberyan, who is also a painter and writer, has long ponytails and wears earrings – a look that commands attention in Yerevan. “I was walking down the street and saw three guys sitting on their haunches,” the comedian said after his performance. “They were looking at me very closely and then one of them said, ‘I’m gonna sell my car and buy earrings’. “So far” mainly concerns Diaspora Armenians and some of the monologue was in English. The actor/writer/painter performed one night for a sold out theater. 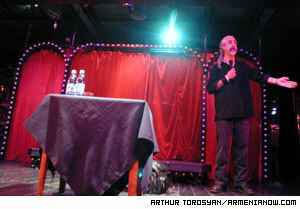 For locals, it was a mild culture shock to hear words that aren’t normally said on Armenian stages. After the performance Berberyan said that when he used the “f-word” one of the audience covered her face and another looked around to see the reaction of people. When they saw others were laughing they laughed too. While about 80 percent of the crowd was Diaspora, locals also were delighted with Berberyan’s one-night show.